FITS OUR 48" ROUND TABLES. USE WITH WEIGHTED UMBRELLA BASE. 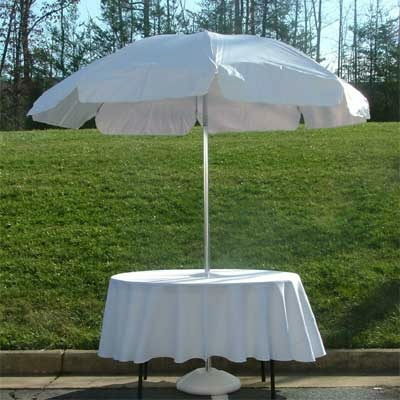 WE ALSO HAVE WHITE 108" ROUND LINEN CLOTHS TO USE WITH THE UMBRELLA AND TABLE. * : Please call us for any questions on our umbrella white rentals in Jackson MI, serving Brooklyn MI, Jonesville MI, Ann Arbor, & Grass Lake in Michigan.